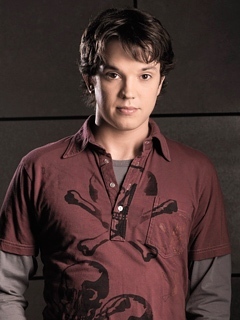 [This interview was conducted by Arieanna, the blogger from whom I took over writing Searching Bones] After writing two posts about Eric Millegan (Zack Addy on ‘Bones’) I emailed Eric to ask for an interview. Eric was very happy to do this exclusive interview with Searching Bones, and I hope my readers enjoy the interview as much as I did. Searching Bones: Hi Eric. You must be so busy now with the new season for Bones (we are, of course, very excited to see what happens in Season 2). I’m thrilled to be added to your website and to have the chance to interview you for our blog. Eric Millegan: Hey. You’re welcome. Yes, I’m busy with the new season. We just finished the second episode. I’m so glad you like the show and are excited to see it! SB: How did you land your role as Zack Addy for Bones? I moved to NYC in 1995. I realized my dream of performing in a Broadway show in 2000. Soon after, I was fortunate enough to book a role in a movie and two guest roles on TV. But then, my TV/film career stalled. 2002- nothing. 2003- nothing. And in 2004? Only one AUDITION. It was for a recurring role on “One Life to Live” and I didn’t book it. I was depressed. Two of my co-stars from “On_Line” (the movie I did) booked series (Harold Perrineau got “Lost” and Vanessa Ferlito got “CSI: NY”) and I was sitting at home unemployed. I decided that I would have to go to L.A.. Only about 4 or 5 shows shoot in NYC. I figured there would be more opportunity in L.A.. But then I got a big break in the theater arena. I booked the lead role in a world premiere of a new musical based on the movie “Harold & Maude” and I was going to be starring opposite Oscar winner Estelle Parsons. This was a big boost of confidence. It was produced by the Paper Mill Playhouse in New Jersey and there was talk that it might go to Broadway. I decided to still make a small trip to L.A. in the fall, before “H&M” rehearsals started, to meet with agents and casting people out there just so they would know who I was, even if the show did go to Broadway. Then I was asked to play the lead in a workshop of a musical based on the movie MASK (the Cher movie from the 80s) and it looked like I would have to cancel my L.A. trip. There wasn’t much time between MASK and H&M to travel to L.A. but a friend of mine told me to go anyway, for the little time I had. I went and met a few agents but none of them were all that interested. I was bummed, so I decided to call all the agents on my list who hadn’t met with me. One of those agents’ assistant asked for my demo tape (scenes from the TV and film stuff that I had done). I brought to her, she liked it, she showed it to the agent, he liked it and agreed to meet with me. He then showed me to the whole office and they agreed to sign me. Big big big break. I then told the office that if H&M went to Broadway, I would do that of course and that if it didn’t, I would move to L.A. the day after it closed. H&M didn’t get the kind of reviews that we hoped it would and it closed on the first Sunday of February in 2005. Like I promised, I flew out to L.A. the very next morning. Three days later, I had an audition to play Zack Addy in a pilot named “Brennan” (which of course, went on to be named “Bones.”) I did a scene from the script (that scene was ultimately shot but cut from the pilot) for the casting director and she decided to have me do the same for the producers, Barry Josephson and Hart Hanson. Barry and Hart decided to show me to executives from 20th Century Fox and the FOX network and on the first day of March, I was offered the job! SB: How would you compare your character, Zack, to yourself? EM: Hm. I skipped the 7th grade. I was Valedictorian in high school. So I suppose I’m smart. But I’m not nearly as smart as Zack. Nor am I as stupid as him. I know what “take a hint” means. SB: What is the most interesting anthropological thing you’ve learned from being on Bones? SB: Which actor is the most fun to work with? The loudest? EM: They are all fun to work with. Seriously. All of them. The loudest is either Emily or me. She and I get in trouble for singing on the set. SB: Which episode of Bones was your favorite, and why?EM: The Christmas episode. It made me cry three times. It was funny and touching and the case was involving as well. SB: What is the most gross thing you’ve had to do while on Bones? EM: Hm. All the corpses are gross. The most gross was the girl in “The Man on Death Row.” Throwing the pig into the wood chipper was pretty gross too. All the fake blood and fake pig meat flying around. That was funny. SB: Can you give us any hints about what will happen in Season 2 of Bones? EM: New character. Played by the beautiful and talented Tamara Taylor. Also, Zack will likely become a doctor. SB: Do you think Zack will ever finish his degree? Start dating? EM: I’ve been told that he will finish at least one of his two degrees. And yea, I hope I start dating. Write to FOX and tell them to find me a girlfriend! All of this said, I don’t ever know for sure what is going to happen next. I find out, one episode at a time, just like you all do. I just find out a month or so before you. Right now, all I really know is what happens in the first three episodes (we start shooting the third one tomorrow). SB: What are your hobbies? Have they changed in the past year? EM: I love the NBA. Watch a lot of basketball. Write a blog for NBA.com. Play a lot of basketball. Played in the NBA Entertainment League. Play a LOT of NBA2K6 on PS2. And I’m really into poker. I definitely started playing more poker when I moved to L.A. I have poker parties at my apartment about once a month. In NYC, I didn’t have a big enough apartment for a party. I also like playing the piano. Again, because I have a bigger apartment now, I was able to get a piano and I obsessively work on various Fugues and Preludes by Bach. When I moved here, I hadn’t played since I was a kid, but now with my own piano, I’ve really gotten into it and I’m much better now than I was when I was taking lessons growing up. SB: What is your favorite novel? EM: Ouch. Sore spot. I don’t really read. I feel like I’m supposed to read more. But I don’t. I read “Bones” scripts and I read screenplays now and then. That’s my reading. And I read the internet. Read ESPN.com. Read the NBA message boards. Read the Bones message boards. I read all of that stuff. If anybody has written about me and thinks I didn’t read it…well, I did. SB: Thanks! I hope you are enjoying the summer weather as much as we are here in Vancouver. EM: Hey, you’re welcome. I’m flattered that you’re interested. Yay, Pacific Northwest! I grew up in Oregon. Thanks for taking an interest in the show. And Eric, any time you’re by the blog, leave a comment. We’d love to hear from you!